The season is finally here…pollen season that is, of course. For some, the spring is a glorious time. A time to go out for walks and play in the garden. However, for many, this is the season for watery eyes, stuffy noses, and pollen allergies. Many Floridians suffer from pollen allergies, but according to Jacksonville Allergy and Asthma of North Florida, there are various ways to lowering your symptoms. The most common tree pollen is Elm, Birch and Pine tree. The best way to reduce allergy symptoms is to avoid contact as much as possible. Limit your time outdoors on high pollen days; always keep windows in your car closed during tree pollen season, and consider wearing gloves or a mask if pollen counts are very high and you must be outside. If possible, remove any trigger trees that are in your yard. If removing the tree is not an option, get it trimmed back as much as possible to reduce the amount of pollen it produces. Many pollen victims have the tendency to try and stay in their homes most of the time. 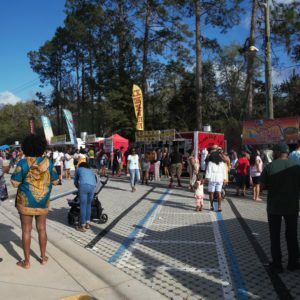 “I try to stay inside most of the time,” says Tiana Davis, a student at the University of North Florida. Nonetheless, pollen is sometimes found within the home.On these up and coming beautiful days, it’s tempting to open the windows and doors for some fresh air-but high pollen counts and windy days will bring pollen inside to get trapped in carpets and furniture. But there are methods to avoid this as well. For families that hang their clothes out to dry, although it can be a money saver, avoid this at all cost it will certainly collect pollen. Many air conditioning units are equipped with whole house filters to trap dust and air particles. Clean and replace filters as recommended by your air conditioning unit and manufacturer’s recommendations. The number one way to prepare for pollen season is to always stay aware. Using the pollen forecast is essential. Be aware of what the coming days will bring. You can visit www.pollen.com or www.weather.com for allergy reports. If it is to hard to avoid allergy season on your own, visit an allergy and asthma specialist for a formal allergy evaluation. It is best to do this before the season begins. They can determine the specific pollen that is irritating your allergies and causing you problems. Over the counter prescriptions and medications are available along with an allergy shot. So, overall pollen will not win, there is still hope.